The plant is probably native to southeastern Europe and western Asia. It is now popular around the world. It grows up to 1.5 meters (4.9 feet) tall, and is cultivated primarily for its large, white, tapered root. 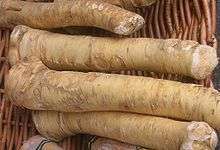 Horseradish is probably indigenous to temperate Eastern Europe, where its Slavic name chren seemed to Augustin Pyramus de Candolle more primitive than any Western synonym. Horseradish has been cultivated since antiquity. According to Greek mythology, the Delphic Oracle told Apollo that the horseradish was worth its weight in gold. Horseradish was known in Egypt in 1500 BC. Dioscorides listed horseradish equally as Persicon sinapi (Diosc. 2.186) or Sinapi persicum (Diosc. 2.168), which Pliny's Natural History reported as Persicon napy; Cato discusses the plant in his treatises on agriculture, and a mural in Pompeii shows the plant. 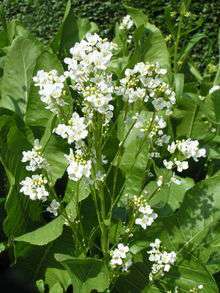 Horseradish is probably the plant mentioned by Pliny the Elder in his Natural History under the name of Amoracia, and recommended by him for its medicinal qualities, and possibly the wild radish, or raphanos agrios of the Greeks. The early Renaissance herbalists Pietro Andrea Mattioli and John Gerard showed it under Raphanus. Though its modern Linnaean genus Armoracia was first applied to it by Heinrich Bernhard Ruppius, in his Flora Jenensis, 1745, Linnaeus called it Coclearia armoracia. Horseradish sauce made from grated horseradish root and vinegar is a popular condiment in the United Kingdom and in Poland. In the UK, it is usually served with roast beef, often as part of a traditional Sunday roast; but can be used in a number of other dishes also, including sandwiches or salads. A variation of horseradish sauce, which in some cases may substitute the vinegar with other products like lemon juice or citric acid, is known in Germany as Tafelmeerrettich. Also popular in the UK is Tewkesbury mustard, a blend of mustard and grated horseradish originating in medieval times and mentioned by Shakespeare (Falstaff says: "his wit's as thick as Tewkesbury Mustard" in Henry IV Part II). A very similar mustard, called Krensenf or Meerrettichsenf, is popular in Austria and parts of Eastern Germany. 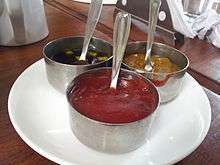 In France, sauce au raifort is popular in Alsatian cuisine. There are two varieties of khreyn. "Red" khreyn is mixed with red beet (beetroot) and "white" khreyn contains no beet. It is popular in Ukraine (under the name of хрін, khrin), in Belarus (under the name of хрэн, chren), in Poland (under the name of chrzan), in the Czech Republic (křen), in Russia (хрен, khren), in Hungary (torma), in Romania (hrean), in Lithuania (krienai), in Bulgaria (хрян, khryan), and in Slovakia (under the name of chren). Having this on the table is a part of Christian Easter and Jewish Passover tradition in Eastern and Central Europe. In Transylvania and other Romanian regions, Red beet with horseradish is also used as a salad served with lamb dishes at Easter called sfecla cu hrean. ↑ The Plant List, Armoracia rusticana P.Gaertn., B.Mey. & Scherb. ↑ Flora of China, 辣根 la gen Armoracia rusticana P. Gaertner et al. ↑ Early Modern translators of Dioscurides offered various names. ↑ Courter, J. W.; Rhodes, A. M. (April–June 1969). "Historical notes on horseradish". Economic Botany. 23 (2): 156–164. doi:10.1007/BF02860621. JSTOR 4253036. 1 2 Pleasant, Barbara (Oct–Nov 2003). "Horseradish". Mother Earth News. Retrieved 2007-07-01. ↑ Phillips, Henry (1822). History of Cultivated Vegetables. H. Colburn and Co. p. 255. ISBN 1-4369-9965-0. ↑ Harper, Douglas. "Online Etymology Dictionary: horseradish". Retrieved 18 November 2012. 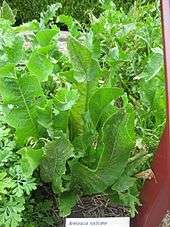 ↑ "How To Grow Horseradish". Retrieved 2007-07-01. ↑ Suzanne Wold-Burkness and Jeff Hahn. "Caterpillar Pests of Cole Crops in Home Gardens". University of Minnesota. Retrieved 2007-09-30. 1 2 Cole, Rosemary A. (1976). "Isothiocyanates, nitriles and thiocyanates as products of autolysis of glucosinolates in Cruciferae". Phytochemutry. 15 (5): 759–762. doi:10.1016/S0031-9422(00)94437-6. ↑ Ohta, Yoshio; Takatani, Kenichi; Kawakishi, Shunro (1995). "Decomposition Rate of Allyl Isothiocyanate in Aqueous Solution". Bioscience Biotechnology and Biochemistry. 59: 102–103. doi:10.1271/bbb.59.102. ↑ "Henry IV, Part II, Scene 4". opensourceshakespeare.org. Retrieved 2008-05-10. ↑ Giambattista Azzolini, Vocabolario vernacolo-italiano pei distretti roveretano e trentino, Venezia, Tip. e calc. di Giuseppe Grimaldo, 1856, p. 120. ↑ Giuseppe Boerio, Dizionario del dialetto veneziano, 3rd edition, Venezia, Reale tipografia di Giovanni Cecchini edit., 1867, p. 207. ↑ Rafano rusticano in www.friul.net. ↑ Jacopo Pirona, Vocabolario friulano, Venezia, coi tipi dello stabilimento Antonelli, 1871, p. 490. ↑ Zanini De Vita, Oretta (2009). Encyclopedia of Pasta. University of California Press. p. 122. ISBN 978-0-520-25522-7. Retrieved 24 June 2014. ↑ "Horseradish Soup Recipe Updated with Photographs – Polish Easter Food". Culture.polishsite.us. Retrieved 2012-07-08. ↑ Arnaud, Celia Henry (2010). "Wasabi:In condiments, horseradish stands in for the real thing". Chemical & Engineering News. American Chemical Society. 88 (12): 48. doi:10.1021/cen-v088n012.p048. Retrieved 11 November 2012. 1 2 "Nutrition facts for prepared horseradish". 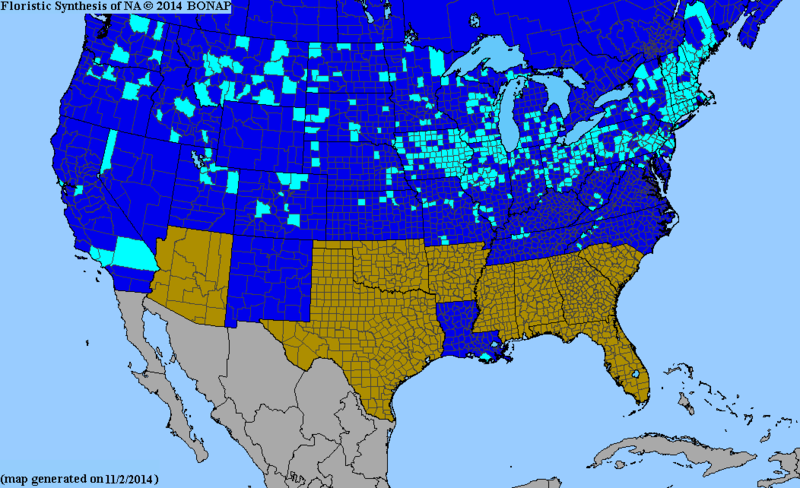 Conde Nast, USDA National Nutrient Database, version SR-21. 2014. Retrieved 12 November 2015. ↑ Bladha, K. Wedelsbäck; Olssonb, K. M. (2011). "Introduction and use of horseradish (Armoracia rusticana) as food and medicine from antiquity to the present: Emphasis on the nordic countries". Journal of Herbs, Spices and Medicinal Plants. 17 (3): 197–213. Chisholm, Hugh, ed. (1911). "Horseradish". Encyclopædia Britannica (11th ed.). Cambridge University Press.